The wait has ended. So have the guesses. This year, the Best of Nollywood Awards holds December 12th in Akure, Ondo State. The governor, Dr Olusegun Mimiko, made this announcement Thursday morning at a meeting with the organisers of BON and select Nollywood stars inside his stately country home in Ondo town, Ondo State. “On behalf of the good people of Ondo State and me, we are set to host the Best of Nollywood Awards this year. We will give spirit and soul to the awards ceremony because it would be held in the best and only international events centre in Nigeria. Our new Dome would make the Expo Centre in Lagos look like a village kitchen,” he boasted. 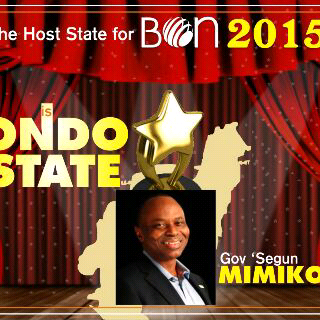 Adducing reasons for consenting to host BON Awards, Governor Mimiko said, “My first reaction when the executive producer mentioned hosting BON Awards to me was that these are not the best of times for any state financially but he assured me that it would not cost the state so much. And I agreed essentially because growing up, we were all victims of cultural imperialism by the West. Of course, at that time, we still had contending views of the East because of the deep rooted culture in their (Indian and Chinese) films.” As time went by however, he said the Nigerian film began to show great promises. Though a successful medical doctor before political adventurism took over, Dr Mimiko’s robust knowledge of the global film industry was not in doubt; which was why he said if there is one area Nigeria has shown the world that she is capable of excelling especially in the last two decades, it is in the creative industry especially the film industry. “So, for me, the celebration of Nollywood is within the context of the cultural, if you like, imperialistic possibilities of Nigeria and why not? So long we talk about our potentials; we could also make Nigerian films a global commodity. If we want to be a dominant country in Africa and a global player, we need to deliberately create our Nollywood narrative by creating a theme around which other sub-themes would be created to sell our country,” he posited. The executive producer, Seun Oloketuyi, thanked the governor for his understanding, love and support for the entertainment industry, and importantly, for agreeing to host the event. Oloketuyi further expressed his appreciation to Governor Mimiko. While urging other governors to take a cue from Governor Mimiko and help the industry grow, Oloketuyi presented him a certificate to symbolize the hosting right. Present at the event were Nollywood stars like Segun Arinze, Yomi Fash Lanso, Fathia Balogun, Ngozi Nwosu, Alex Ekubo, Ebube Nwagbo, Toyosi Adesanya and Amanda Ebeye among others.